Cousins Subs franchise business opportunity. 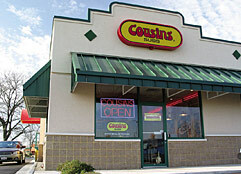 Free Cousins Subs business franchise information. Cousins Subs, a Midwest-based quick service restaurant chain in the fast growing sub sandwich industry, is seeking qualified individuals interested in becoming single unit or multi unit franchisees. We are looking for people to help us grow the brand within these areas: <?xml:namespace prefix = st1 ns = "urn:schemas-microsoft-com:office:smarttags" />Arizona, Illinois, Indiana, Iowa, Michigan, Minnesota, Missouri, North Dakota, Ohio, South Dakota and Wisconsin. We’ve been growing steadily since 1972 and had a company record setting year in 2005. We have high expectations for all upcoming years and invite you to learn more about our exciting franchise opportunity. Why franchise with Cousins Subs? Going into business for yourself can be daunting which is why franchising with Cousins Subs is such a great opportunity. You get the rewards of running your own business with the personal guidance and support of a dedicated team of experts. You have a lot of choices when it comes to franchising which is why we've been hard at work adding value to the investment of time and money our franchise owners put in and it's showing. Great sandwiches, excellent support, and our commitment to our franchise owners makes this an opportunity you can't afford to miss. Better Bread. Better Subs. Better Franchise. To learn more about the Cousins Subs food franchise opportunity, simply complete the form below.